More than two-thirds of mines in eastern Democratic Republic Congo which produced "conflict minerals" four years ago are no longer run by warlords, a report by US-based Enough Project says. It follows a US law implemented in 2010 which required firms to determine the origin of minerals used in products. Tin, tantalum and tungsten, used to make computers and mobile phones, used to generate $185m (£110m) a year for armed groups, the report said. This fuelled decades of conflict. The US law was brought in under the Dodd-Frank Financial Reform Act that requires any company that might be using conflict minerals register with the US Securities and Exchange Commission and then disclose its supply chain. This, together with other reforms and the recent defeat by UN troops of two powerful rebel groups, has helped significantly in reducing the number of mines run by militias, the Enough Project said. However, artisanal mining of gold was still funding army commanders, its report said. This rare good news from DR Congo illustrates how a consumer campaign in the rich world can impact positively in an under-developed country. The hi-tech US companies making laptops and smart phones simply did not want to be associated with warlords committing atrocities - and more to the point, perhaps, knew that campaigners in the US would expose them if they did. So pressure from US consumers, working with the new US law which required companies to guarantee a "clean" supply chain, has forced change. Of course, a more robust military campaign by the UN's Intervention Brigade against some of the armed groups has also helped. The next stop for the campaigners, after the computer companies, will be jewellers. 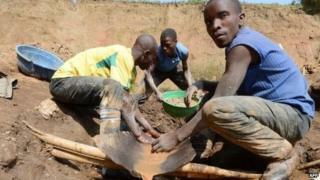 It will be interesting to see if they can pull off the same effect in DR Congo's gold mines. Many of these are still controlled by warlords operating with impunity. The Enough Project said its report was based on five months of field research which showed that 67% of tin, tantalum (refined from coltan) and tungsten in North Kivu, South Kivu and Maniema provinces were no longer in the hands of the armed groups or the Congolese army. It said this contrasted with a 2010 UN group of experts report which stated that "In the Kivu provinces, almost every mining deposit [was] controlled by a military group". For the first time in DR Congo's history there is now a validation process to evaluate whether mines are conflict-free, the Enough Project said. The reforms have also meant that wages have gone up for miners - in some areas threefold - and more workers now receive safety equipment, it said.